The ECB decision to launch a quantitative easing (QE) programme was widely anticipated. Indeed, on several occasions in the second half of 2014 Mario Draghi had reiterated that the Governing Council was unanimous in its commitment to take the steps needed, in accordance with its mandate, to fight against the risk of a prolonged slowdown in inflation. Both the scale and the characteristics of the ECB plan announced on 22 January 2014 sent a strong, though perhaps belated signal of the Bank’s commitment to fight the risk of deflation, which has been spreading in the euro zone, as can be seen in particular in inflation expectations over a two-year horizon (Figure 1). In a special study entitled, “Que peut-on attendre du l’assouplissement quantitatif de la BCE?” [“What can we expect from the ECB’s quantitative easing?”], we clarify the implications of this new strategy by explaining the mechanisms for the transmission of quantitative easing, drawing on the numerous empirical studies on previous such programmes in the US, the UK and Japan. The terms of the quantitative easing decided by the ECB are indeed similar to those adopted by other central banks, especially by the US Federal Reserve and the Bank of England, which make comparisons legitimate. It appears from the American, British and Japanese experience that the measures implemented have led to a decline in sovereign interest rates and more generally to an improvement in the financial conditions of the overall economy. This has been the result of sending a signal about the present and future stance of monetary policy and a reallocation of investors’ portfolios. Some studies  also show that the US QE caused a depreciation of the dollar. The transmission of QE from the ECB to this variable could be critical in the case of the euro zone. 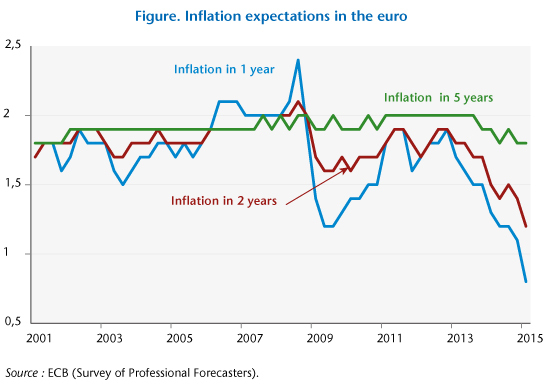 An analysis using VAR models shows that the monetary policy measures taken by the ECB will have a significant impact on the euro but also on inflation and inflationary expectations. It is likely that the effects of the depreciation of the euro on European economic activity will be positive (cf. Bruno Ducoudré and Eric Heyer), which would make it easier for Mario Draghi to bring inflation back on target. The measure would therefore have the positive effects expected; however, it might be regrettable that it was not implemented earlier, when the euro zone was mired in recession. Inflation in the euro zone has fallen constantly since late 2011, reflecting a gathering deflationary risk month after month. In fact, the implementation of QE from March 2015 will consolidate and strengthen a recovery that would undoubtedly have occurred anyway. Better late than never! The final impact on the real economy is, however, less certain, in particular because the demand for credit has remained stagnant. Gagnon, J., Raskin, M., Remache, J. and Sack, B. (2011). “The financial market effects of the Federal Reserve’s large-scale asset purchases,” International Journal of Central Banking, vol. 7(10), pp. 3-43. ← Which companies are investing in France?